This giveaway is now closed. You can view the winner's announcement in this post. Thanks so much for entering! Today is the official one year anniversary of painted Lady fingers! Hooray! Let's continue the celebration with a stamping nail art image plate giveaway from chez-delaney. The winner will get to select 8 image plates of her choice. Below are the images of the design plates I chose from chez-delaney. Which would you choose? The black and white images are from chez-delaney.com. B22 is a standard size plate. The 6 plates from the H and P series are larger plates. The scale is easier to see in my photo with the eight plates against the silk fabric. 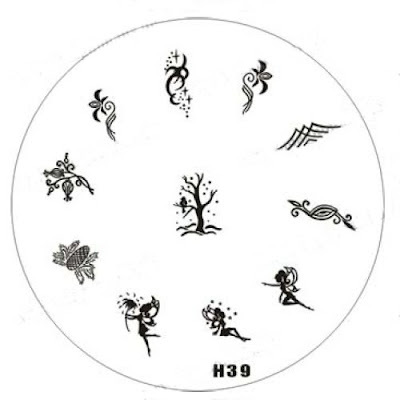 The winner may choose any eight plates from in stock items at the time of the drawing. There will be some larger square design plates added to the site that are not part of the giveaway. The image plates will be shipped directly to the winner from chez-delaney. The Pick Your Plates at Chez-Delaney Giveaway is open internationally for followers and e-mail subscribers. The contest runs through the end of the day August 14th. To keep this simple, I am willing to count the date as the last available time zone worldwide. As long as it is August 14th somewhere on the planet, you may still enter. 3) Let me know: Which design plates would you choose from chez-delaney? Do you have a favorite stamping image? 1 entry. 4) Make a purchase at chez-delaney during the giveaway period. 5 entries. 8)In appreciation, I am going to add an extra entry for those who comment regularly on non-giveaway posts. I do enjoy reading your feedback! Thank you! Not to worry, I am very inclusive with this extra entry. 1 entry. You are welcome to put all your entries in one comment or return to the contest post with comments for each entry. Either way works for me. Your entries don't have to be sequential. Enter in any way you like whenever you like before the end of the day August 14th. Please feel free to enter any and all of my anniversary giveaways. There is no limit to how many giveaways you can win! I will gladly support your good fortune if your name appears more than once. Thanks so much for visiting painted Lady fingers over the past year. xoxo! This giveaway is now closed. Thank you for participating. email is cat dot barts at gmail dot com. I also love the one with the deer jumping, or whatever creature it is, because it reminds me of my horse! ps I'd love to be on your blog roll! I don't comment often, but I'm in awe of your nail art skills. I follow with Google under Aurora's Nails. I would choose Image Plate H21 with the pawprints! I have eyed some of chez-delaney plates before and drooling about them. 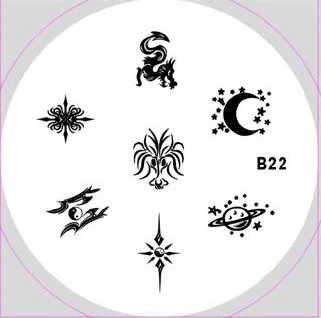 I like B22 for the moon and stars; H42 for the comet and the tribal looks. My favorite would have to be the cuuute Easter one! I love the cute little bunnies! 2. B22 is my favourite image plate, I like the Saturn and moon images. I would choose the following: A04, T14, T39, P55, M75, H44, A03, and A10. I can't really pick a favorite, I like so many of them! 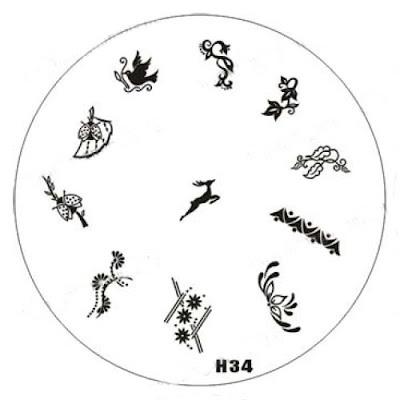 I really like the cute animal prints on image plate H45! So adorable! that awesome!!! i love chez-delaney plates!! u were on my fab blogroll list! and i'd def want H20 because it's all beach-themed... B38 cause they look fun... and P30 for the cat! Thank you for that giveaway! Hey! Happy blogging birthday! :) I'd love to be entered into this giveaway since I really want to get into nail stamping art! Plates-wise, I would definitely pick B85, H21, M69, M73 (music!!!) and P48. Gosh there are really nice designs! And I comment regularly. XD Thank you! I follow via Google Friend Connect as joanne.j I also subscribed via e-mail. Fantastic giveaway! I follow via GFC and my email is robyndskinner at gmail dot com. I'd choose M44 (french tips) M69 (zebra print!) B101 (tribal flowers) B22 (moon!) and H12, H20, H2 and H3! I've never used a stamp nail art plate before but I would love to try it! I just buy those little nail stickers and put clear nail polish over them so they'd stay on for a long time. I chose from the ones listed above. Im fairly new to the twitter world, I don't have but a few followers, feel free to follow me! and if possible instead of 3 more plates a double tampon! Thank your for this giveaway. 1. I think I follow through Google Connect (I usually read via Google Reader). 3) I think my fav would be H45 (since H6 is out of stock, that one is awesome), because it has peacocks on it and i just adore peacocks and their feathers (im already working my second peacockinspired costume with feathers). 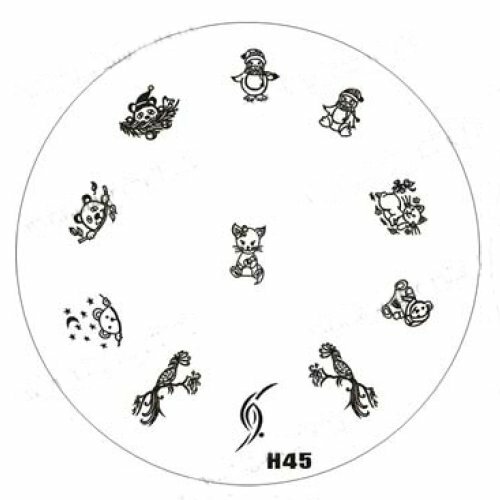 BTW i love that these (A) imageplates have the same stamp in mirrored images aswell. Konad doesnt have that, and it ssometimes really annoying. Hope I win and happy anniversary! 7) I have your blog in my blog-roll. B21, H21, H28, H44, M53, P57, S9 and T37. 3. I'll choose M78, A07, B26, B69, H3, H28, M45, M70. 3. I would choose: H9, H15, H17, H22, H31, T04, T35, and T39. My favorite plate that I own from chez-delaney is T32. 4. I do come here to comment several of your post! Hi Diana (again! I'm a little behind in my dashboard, can you tell?) Congratulations on your official YEAR! of blogging! *hugs* What a wonderful set of giveaways you're having! That was fun! :) I'm adding Chez Delaney to my stalking list. I've heard so many good things about chez-delaney! I am a follower via GFC "Skulda". Hi there... u have a good post. i like it! I follow through Google friend connect.... hope u do the same to mine. I'm a google follower ladyothelake41athotmaildotcom. There are so many great plates but I love b22, a08, a09, A20 (OMG A20! ), B118, h2, h4 and t28 for the cat! I follow via Google Friend Connect ! I love H28 the best I think! Hehe, I love getting to talk about my favorite plates - in this case its plate T29, the halloween plate. Super cute, and that skull and cat are so cool! I follow via GFC as terrenity, and my e-mail is terrenity(at)gmail(dot)com. I would pick plates B115, B06, T37, T41, H20, T19, T40, and H1. My favorite image is the seahorse! Hi I follow by GFC as MissMidnightBlue. Can't ya tell I love Halloween. I like the Série T plate...the Happy Halloween plate. I subscribe via email and I follow on GFC! Wow, my head might explode trying to explore each plate, haha. Uhm, I'll choose two that I like for sure: P55 and A20. A lot of the H series that I like are out of stock! I like ones with cute or cartoon images, especially the Japanese themed plate, S9. Your giveaway info is on the sidebar of my blog and you are also in my blog roll. Hi! I'm shichan from Italy! You're blog is on my blogroll! You are on my blorgroll. Hi! I follow you with GFC "bichounette62100"
I am a follower through GFC as contests and such. I would love to enter in this awesome giveaway. I'm your new follower. I follow you via GFC as Ivana. Hmm... Which one I would choose (really tough decision :)): M14, M73, M80, T17, A02, H5, T40 and A04. 1. I follow thru GFC under the name Deanna. 2. My email is punkstardust [at] gmail.com. I've added you to my blogroll - I just figured out how to do the blogroll tonight. Woohoo! The plates I would choose are: H21, H30, H33, H34, S9, T21 and T28. My favorite image is the squirrel on H21. I follow via Google Friend Connect. My email is dares3000@yahoo.com. My favourite plate is M70. I am a follower on GFC (Alexa1202) and my email is alexa12_02@yahoo.com. I yould choose from chez-delaney: H45, H21, B119, M67, M79, T28, T13. You are also on my blogrool. P.S: I am a beginner regarding nail designs, but I would like to be on your blogroll. I would choose the A07 plate, is the beautifulest plate that I've ever seen! If I won and they were in stock, I would probably choose these plates: A20, H2, H6, H17, T41, M69, M74 and M78. I added your giveaway with photo at http://fluffypuppynow.blogspot.com/p/contestsgiveaways.html. and you are already on my blogroll. I love Chez-delaney plates and have a few but have never been able to get the one with Mickey and Minniw mouse on it so I would love that one for sure. My fav is the plate with the ivy and bird design. - I like A07, A10, H14, H27, M74, M71, M77, T08. 2. I would choose P21, P55, T37, T41, A05, A13, H28, and M26. i use image plat, but i have only 6 of them. Hi, I'm a GFC follower as Arrianne. My favorite plate out of these is H45, the bear with the moon and stars is definitely my favorite image. 3 - I would choose B20, B78, M74, S9, T01, T16, B22 - that was hard. 1&2)I follow with Google Friend Connect. 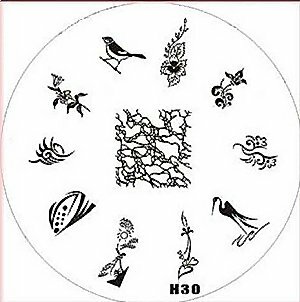 3) I would pick plates T04, P30, T28, T29, T41, H20, B01, & A20. My favorite image in the middle one on plate T41, be3cause I love to wear green polish, so this would be great with all the ones I own. Thanks for the neat contest. H1, H14, H28, M69, M74, T21, T37, T41. 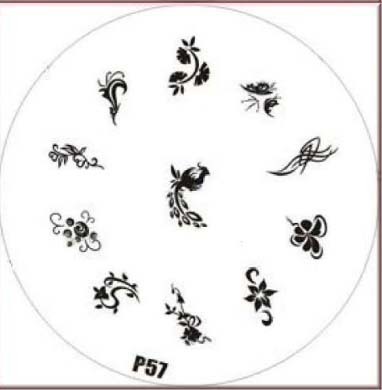 I like plate B65. Just set my eyes on the Big plate WOW that is so a must-have ! I follow via GFC and I subscribe via e-mail. 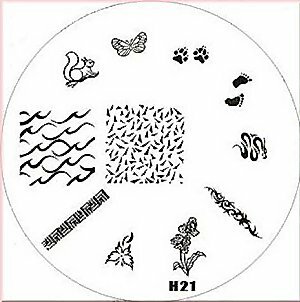 My favorite is plate h21. I follow on GFC, I'm at meowykittyface at gmail dotcom. I'd choose: H27, H28, M69, A05, A18, A20, B119, and H22. I love full nail plates, but I don't have a favorite (yet). I've subscribed and publish your drawing on my blog! The plates I would pick are: A5, A18, A20, H37, M44, M26, M78, and T41. I especially love the full nail leaf designs on A20 and the stylized fall stuff on T41. I love leaves and fall!! Congrats on the anniversary. One year with my blog seems so far away to me right now. I have put your giveaway up in my sidebar on my blog and you are also on my blogroll. I like the look of T41. I love the tree in the middle. I am going to place an order for 3 plates on Thursday when I get paid. So I will comment again after I do that. Do you need anything as proof that I did buy a plate? 3;if I would win I`d pick these 8 plates: A07, H30, H39, M69, M70, M73, M80 and T34. M70 being my favorite. Good luck everyone!! thank you Diana for organising an amazing give-away again!! Hello ! I want to participate !! and my favorite plate is the A07, I really apreciate that the sampting image are in symetry. Chez-delaney - lots of goodness would like H9, H11, H20, A08...there are too many!!! Don't really have a fave yet. But, love them. I'm a gfc follower as Grace Wong! 1. I follow you via Google Friend Connect (Brenda). 2. my email address is bley28(at)gmail(dot)com. What a great giveaway! I'm following you with Floor en Marjolein. I follow via GFC (Judith). Which design plates would you choose from chez-delaney? Do you have a favorite stamping image? I love the full nail images on A05, A06 & A18. B33 & B119 have really appealing designs for french tips. I follow with GFC as Shiny! 1. I'm a follower via GFC: 'chelle. 3. I'd choose T20, T37 and P7. 5. I've posted about your awesome giveaway in my giveaway sidebar on my blog: http://cosmeticcupcake.com. 7. You are already on my blogroll! http://cosmeticcupcake.com. Hi! I'm a follower through GFC with the username Stefany. I'm a happy follower via RSS Feed and Google Friend Connect as "Lissi." I always got get the number for this plate. But I'm dying to get the plate that has a dolphin on it and the plate that has Hello Kitty on it (for my niece)! I posted this giveaway on the sidebar of my blog under Giveaway Announcements. You are already on my blogroll. It displayed the 25 most recently updated blogs. I'm a follower through Google Friend Connect as Susy. And I would choose these plates: A04, B20, B65, H14, H33, T33, T37, T39. I follow by email. njal13 @ aol . com. i choosed all this,because i love flowers and nature! I wish good luck to all the girls that participate. following u via google friend connect by the username 'Ezzy'. if i win i will get the following plate:- T22,P21,P48,P51,M81,M80,M67 and M76. The plates I would chose are: M44, M69, M79, M71, M73, M81, B19 and H21. ...I´d really love to win this giveaway with these amazing stamping plates!!! thanks for the giveaway girl!!!!! I follow through email @ swooz99@cox.net! 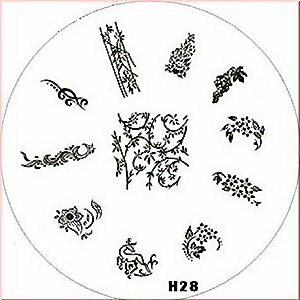 I'd like to try plates B20, B26 and B78 (especially love the crazy crab!!!) as well as the huge square plate. I follow via Google Friend Connect and my email is melissie.w@gmail.com. what an awesome giveaway. if i could choose i would get the plate with the adoreable little duck images and also the plate with the tree. I really enjoyed your blog. I pointed to the drawing!